Camarones a la diabla is one of those items that is on almost every Mexican/Tex-Mex/South American restaurant menu but every place you order it, it’s completely different. Sometimes it’s made with a dark red chile de arbol sauce, sometimes with habanero salsa, sometimes with chipotle peppers, and sometimes — in terrible places — it’s more like shrimp covered in spicy barbecue sauce. My version of camarones a la diabla uses tomato and guajillo chiles for the base, with chile de arbol and habanero for the heat because, for us, chile de arbol alone didn’t cut it. A little vinegar, garlic, salt and pepper and there you have a very easy (and quick) diablo shrimp on the table! Serve it with white rice and black beans. 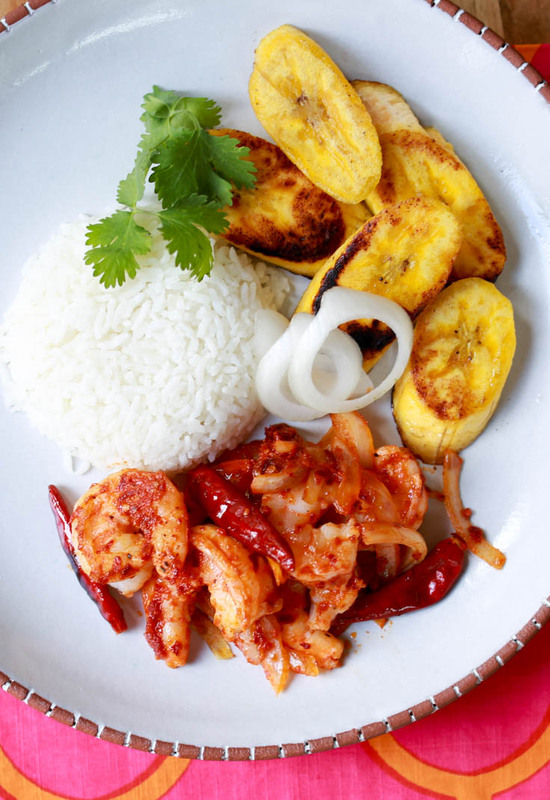 Fried plantains or summer squash or a salad are good choices for a vegetable side dish. 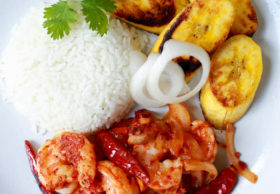 Have your rice and beans already cooked and hot before you start cooking the shrimp because once the shrimp is in the pan, dinner is almost ready! If you make the sauce a few days ahead of time, you’ll set yourself up for a nearly instant dinner. Peel the shrimp, leaving the tails on for presentation. Lay on a towel to dry. Set aside while you make the sauce. Chop the tomato and put it in the blender. 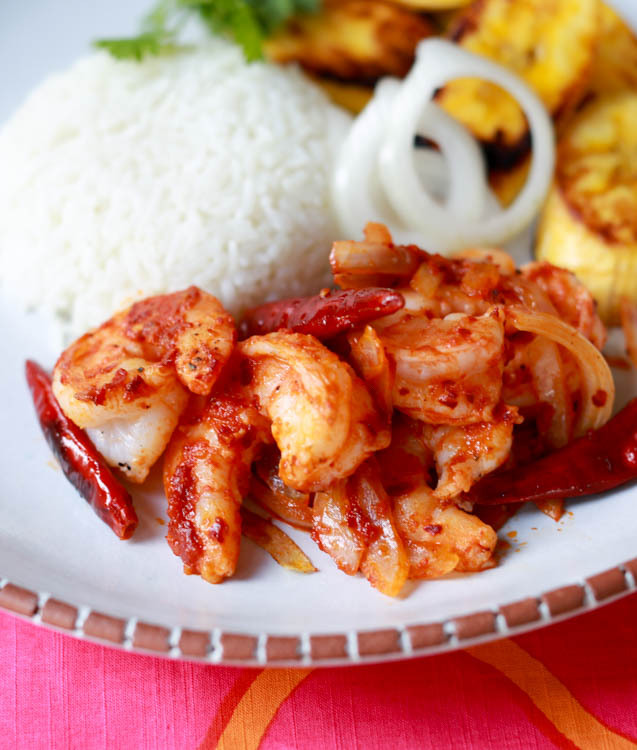 Toast the guajillo and arbol chiles in a dry skillet until fragrant. Cover with boiling water and simmer 5 minutes until softened. Remove stems and seeds from guajillo. Heat half the butter in a large skillet and add the onion strips. Saute a few minutes over medium-high until softened and the butter starts to brown. Remove onions and butter. Add remaining butter and melt. Lay shrimp in a single layer and cook 60 seconds. Turn and cook 30 seconds. Add onions and sauce and stir gently. Simmer 30-60 seconds. Serve. ay caramba! that looks delish! That sure does look amazing – wish my family enjoyed a bit more spice – when it’s only me, I tend to skip spicy food. Maybe I’ll make this all for myself!! Hi – I went to print the recipe – and almost missed the print button. For others, it’s a little icon on the top right of the recipe. Wow! This recipe came out spectacular. Thanks for sharing. Spicy and delicious!!! Added Mexican table cream To put the flame out a bit. It was so goid! Thank you for this recipe!